Two startups are trying to do for ebooks what Netflix does for movies. 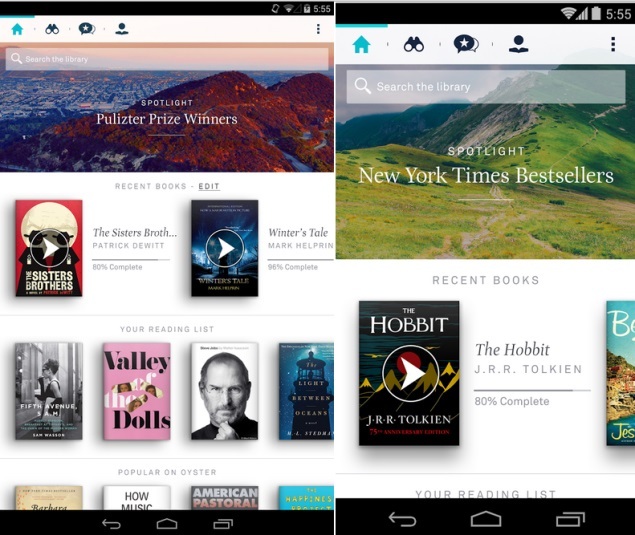 Oyster and Scribd let you read as many books as you want for a monthly price - $10 for Oyster and $9 for Scribd. I was skeptical at first. I can never find enough time to read, and I'm picky about what I do read. I was worried about their limited book selections. Just don't think it'll be the same as walking into a library and finding just about any book you want. I checked several titles from my wish list and asked colleagues for other suggestions, including a few for kids or in foreign languages. Of the 75 I checked, Oyster had 17 and Scribd had 16. For some popular novels, such as "The Hunger Games" series and "A Fault in Our Stars," I got readers' guides and other companions, but not the actual books. Both services have selected titles from Simon & Schuster, HarperCollins and lots of smaller publishers, but other major U.S. publishers - Hachette, Macmillan and Penguin Random House - remain holdouts. And even when there's a deal with a publisher, newer books tend to be excluded. Avid readers won't be bored, though. When I signed up, Scribd asked about the types of books I like. Oyster didn't but still made good recommendations based on what other subscribers are reading. I quickly found about two dozen books between the two services. Each time I added a title, I got recommendations for more. I just finished books on lobster populations and the Ben & Jerry's ice cream company. I'm now reading about Lance Armstrong and the doping scandal - another book I wouldn't have known about if it hadn't popped up on Scribd. In that sense, both services are much like Netflix. Netflix's streaming selection looks poor when you are searching for a specific title, but Netflix is smart enough to recommend enough movies to keep you paying $8 or $9 a month. Neither Oyster nor Scribd works on dedicated e-readers such as Amazon's Kindle Paperwhite. Rather, you need a device that lets you install apps. Apps for both services offer features typical for ebooks. You can start a book on one device and pick up where you left off on another, though I've often run into syncing problems with both. You can see where you are in a book, change text size and add notes. The options aren't as extensive as what I'm used to with Kindle devices and apps, though. Of the two, I like Oyster's apps and ebook selection better, and it's been adding features and device support quickly to catch up with Scribd. But it's also $1 a month more. I tend to prefer distraction-free reading on a dedicated e-reader, but phones and tablets work when I'm able to exercise some discipline from checking email and Facebook. Plus, I'm more likely to be carrying a phone, so I'm able to get reading done while waiting for a bus or tardy friends. There are plenty of other ways to get ebooks for free or for a set price. Check your local library for starters. If you have Amazon's $99-a-year Prime membership, you can read an ebook for free each month if you also have a Kindle device or the upcoming Fire phone, though you're not offered everything that Amazon makes available for purchase. If you read just one book a month, you're probably better off buying it - typically for less than the monthly subscription price. You own the book outright that way, and the selection is better. With Oyster and Scribd, access to the books ends once you cancel your subscription, which you can do anytime. 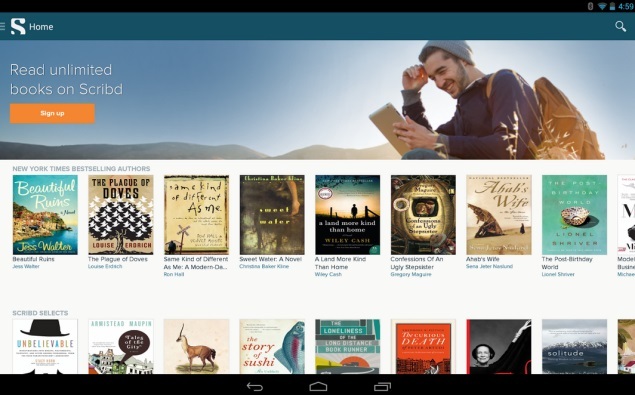 If you read two or three books a month, consider a discount ebook service. With Entitle, for instance, you get two ebooks a month for $10, and you own them forever. Oyster and Scribd are good if you read three or more books, or if you like to sample - start several books before deciding which ones interest you enough to finish. In a sense, these services aren't like Netflix because it takes longer to finish a book. You can get your money's worth watching 10 hours of Netflix on a single weekend. Those 10 hours might be enough time for just one or two books. Both services offer the first month free so you can see for yourself how much you can read. A good time to try is when you're heading to the beach for the week. product Oyster and Scribd are good if you read three or more books, or if you like to sample - start several books before deciding which ones interest you.